I received an email from Blogger the other day informing me that they're shutting down ftp support. Since my blog is ftp-based, this means it will be disappearing unless I move it over to another format... which I don't plan to do because I no longer post here. My one pattern will still be available on Ravelry but once the blog is gone, it's gone. 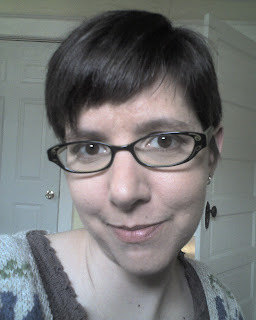 I'll still be around to read and comment on all your blogs and Ravelry projects though! I will definitely continue knitting as it helps keep me sane in my busy, hectic life and I will take a few minutes every once in awhile to keep up with my projects on Ravelry. Keep up with me there if you'd like, my username is katiedid. So I promised an exciting post... because I thought I would be done with my sweater and I would have bought beautiful yarn in Fargo to show you all. I didn't end up find the yarn I wanted in Fargo and I still have a little over a sleeve to go on the sweater (not to mention the fact that I haven't bought the buttons yet). 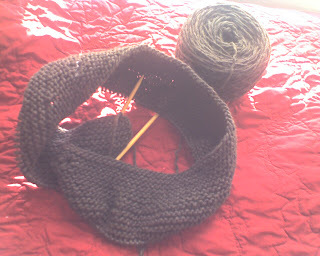 *sigh* I'm such a boring knit blogger. 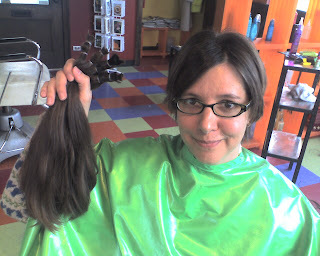 But I did get a haircut! What do you think? I'm thinking I'm going to get even more off the top... it really wants to stick up and look fluffy and I would like it to be a little more sleek and lay more flat. I love the shortness in general though! It's so fun! I've been knitting a little. You don't really want to see the same sweater with just another couple of inches of stockinette (and decreases) added on, do you? I tried it on the other night and just have to say: it is going to be cuuuuuu-UTE! I'm excited! This morning Kurt made me crepes and I made a blueberry sauce to go with them. It's our Mother's Day tradition except usually I am making the crepes. He has grown up so much in the last year that him making them was just a natural progression. He's gotten to be quite the cook. I'll be spending my day studying for my exam and lounging around on the couch, which is just fine with me. Happy Mother's Day, for you mothers out there! I am almost to the waist shaping. I ended up choosing the Garter Yoke Cardi, which Big Geek Beth just finished. It's simple and cute and (almost) what I was looking for in a cardigan pattern. I'm using up the rest of my Harmony 10 ply in brown and it is going fast. I love size 8 needles! 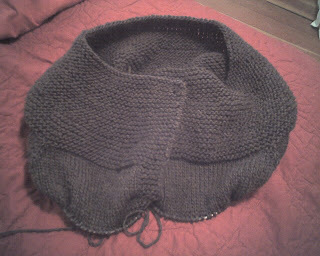 This is the yoke last week after I figured out how to do the couple of short rows it requires. Thanks for the help Beth and Ravelry peeps! And here is it now. 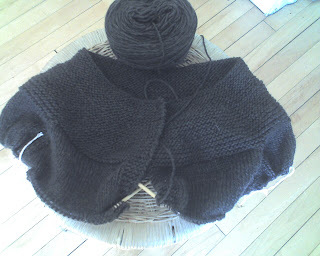 I am ready to slip off the stitches for the sleeves and continue with the body. At this rate, I'll be done before summer weather really hits and might even get to wear it a few times. I noticed something last night in the pattern that I was going to mention though. I had been debating what size to make but because I've been making pretty fitted cardigans and sweaters lately I decided to go with a little extra ease and try modding it to a 35" (the options are 34" then 36"). Luckily, last night as I got to the sleeves where the first size decision needs to be made, I took a look at the schematic which states that the 34" is actually 35.5"... is this normal? Most patterns I've made seem to be the real size they state, not with ease built in. I'm glad I double-checked! I'm seeing an end to the school year right now. Next week I have a couple of last exams and then the week after I have finals. Unfortunately, but not really because it will be great, I start a class immediately the next week and working full-time in the lab for the whole summer. It's going to be awesome! But busy... hopefully I will find more time to knit and blog. It's Lambing Season over at Farmgirl Fare and the little tiny lambs seem even more cute this year than they have in the past few. Check it out but be forewarned that the cuteness will almost melt your brain. To Knit or To Study?